Which transformer to buy for 8878 rechargeable battery? I'm planning to buy the PF rechargeable battery for a project I'm working on. The 9V 9833 transformer is on sale, but can I use this to charge the 8878 rechargeable battery? The battery description says to use the newer 10V 8887 transformer, but if the cheaper 9V transformer will work, I'd like to save some money. We discussed this topic a lot on the Czech forum when the battery was released. The problem is that you need DC which is quite unusual for the transformers. I had to buy the original one as well although its price is very high for something made in China. Peeron.com lists the 8887 "Transformer 10V DC" also as 86444, "Electric Train Speed Regulator 10V Power Adaptor for 120v 60Hz". 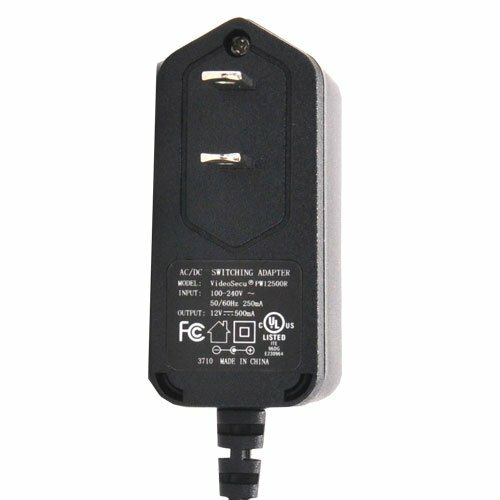 Bricklink.com has various "Transformers" listed, so for European use, the 10VDC 9833 "AC Adapter, 230V - 10V Transformer" works. 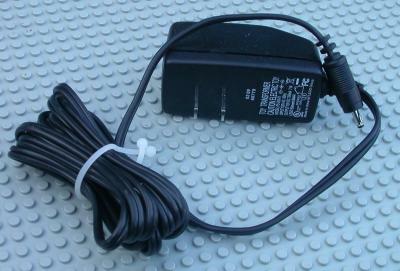 Note that there is a 9833-3 "AC Adapter, 230V - 10V Transformer Type G Plug (British)". 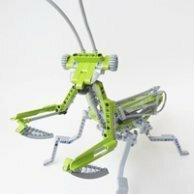 See http://www.bricklink.com/catalogList.asp?q=transformer for the entire list. Peeron lists the 9833-1 as 230V, and 9833-2 as 120V (see http://peeron.com/cgi-bin/invcgis/psearch?...&limit=none ). you may want to browse through this thread. It is about train and PF, but when it comes to charging its all the same. Thanks. I'm sorry my knowledge of electrical stuff is somewhat limited. Am I understanding correctly that I can use a DC 12V at 550mA transformer from my local electronics store to charge the battery? 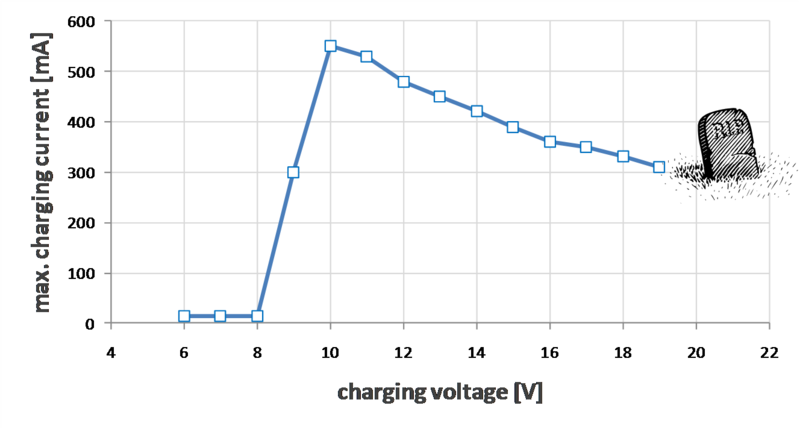 "1) The 7.4 V/1.1 A LEGO PF Lithium polymer rechargeable battery can be charged with a broad range of DC input voltages ranging from 9 V to 18 V, see figure below. 10 V or above is recommended, since the then available full charging current is minimizing charging time. 12 V seem to represent the best price-performance ratio, as judged from the availability of cheap “wall wart” type power supplies. In other words: You don’t need to buy the way too expensive 10 V LEGO charger!" The DC 12V 550 mA transformer (that you have in mind) may be "off of the graph" below. The "Maximum Charging Current" should be more like 480 mA at 12V -- can you find something like that at Radio Shack? Dluders, can you check your transformer and see what the plug layout is? There should be a little diagram with a + and - that shows the polarity of the plug. It's listed at DC 12V 500mA. It's not 480, so I'm not sure if that would work. I'll look around a bit more. There is an "Efficiency Level IV" on the back of the Lego transformer; I don't know what that means exactly but I do know it charges the LiPo PF Rechargeable battery fairly quickly. Am I understanding correctly that I can use a DC 12V at 550mA transformer from my local electronics store to charge the battery? Absolutely. The amperage rating could be higher (something like 750 mA or 1 A, the more the safer), but is not necessary. Just try it out - the LiPo will not take any damage. The top one will work for sure! The current (in mA) on the graph is the maximum current drawn by the LiPo. It simply "wants" that much. You don't need to match the power supplies rated current with the current drawn by the LiPo. Whenever you have a power supply which can deliver 500 mA or more, it will work out. In other words: A 12 V DC power supply with a rating of 5 A output current would simply result in 480 mA going into the LiPo. If you have one with 1 Amp, same thing; as well as with one that can only deliver 500 mA. It's the LiPo that determines the maximum current. For the measurements I used a laboratory power supply with a maximum output current of 5 A.
I am assuming that there is some "factor of safety" built into all electronic circuits. However, one must guard against OVERHEATING the battery by not passing too much current into it. Current --> Friction --> HEAT. Thanks for all the great help guys! One last question: What size plug do I need for the rechargeable battery? The transformer I found on amazon has a 2.1mm plug. I don't have a caliper, but I "eyeballed" the diameter of the plug that goes into the Lego 8878 PF Rechargeable Battery Box with a metric ruler. It appears to be ~2.8 mm in diameter. the plug is a 3.5 mm with (+) in the center. I googled a little ... here is a link (just as an example!) to a power supply that will work very well - I bought mine from Fry's as well and they are in NC as well - maybe there is one around the corner. There is absolutely nothing wrong with DLuders suggestion to go with the LEGO 10V DC supply - in contrast!!! With the one shown above you can do other things as well. It has a rating of 1800 mA - great for electronic stuff that is much hungrier than the LiPo. And you can adjust the voltage in steps. Once again: The only thing that can overheat is the power supply (in case it has lower amperage, lets say 300 mA and no overheat protection), not the (expensive) LiPo. The LiPo has built-in electronics that takes care of basically "everything". Using a larger transformer does not result in any extra heat at all. The rating on the transformer is the maximum amount of current that it is capable of delivering, but it will only actually deliver what the load calls for. The battery charger only draws 0.48A when the voltage is 10V, so literally any 10V transformer with at least that capacity will deliver exactly the same total power to the battery. No difference at all. Now if you used a charger that charged at many amps, that would be a different story. You would destroy the battery immediately. But in this case the charging circuitry is part of the battery so you don't have to worry about that. The transformer is only supplying a power source for the charger. The charger will take care of setting the right charging voltage and current.